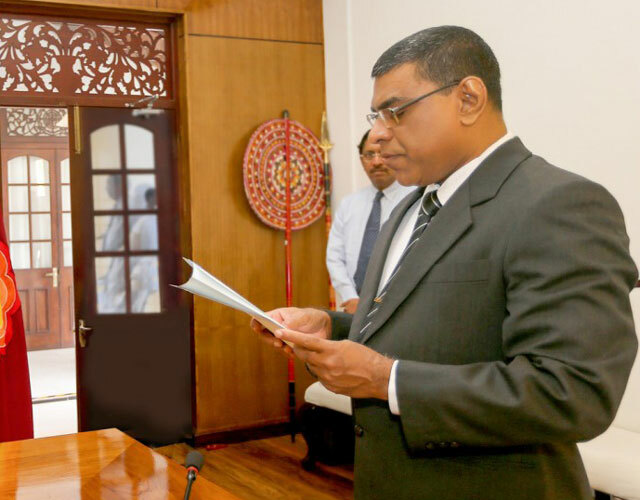 Justice Preethi Padman Surasena took oaths as the President of the Court of Appeal before President Maithripala Sirisena, today. Justice Preethi Padman Surasena having studied the subjects of physics, applied mathematics and pure mathematics for his Bachelor of Science degree (B.Sc) obtained his first degree from University of Colombo in the year 1984. Thereafter, having entered the Sri Lanka Law College, he was enrolled as the Attorney-at-law of the Supreme Court of the Democratic Socialist Republic of Sri Lanka in 1989. Few months later he joined the Attorney General's department as a State Counsel and was involved in conducting criminal prosecutions in High Courts in various parts of the island. He was subsequently promoted as a Senior State Counsel in the year of 2000. He obtained a postgraduate diploma in Forensic Medicine and Science from the University of Colombo in the year 2007. He had functioned as an examiner for the subject of Criminal Procedure at the Sri Lanka Law College. In the year 2005, he earned a Master Degree in Law (LL.M) by the Queen Mary and West Field College of the University of London. He was appointed a Judge of High Court in January 2007 and functioned as a presiding judge in the High Courts of various provinces. He was elected the President of the High Court Judges Association in 2015. In 2015, he was appointed as the chairman of Presidential Commission of Inquiry to Investigate and Inquire into Serious Acts of Frauds, Corruption and Abuse of Powers, State Resources and Privileges. He was appointed a Judge of Court of Appeal in January 20, 2016.